Will the booze cruise be replaced by the Loos cruise I wonder? Over here in USAnia, Amazon will deliver jumbo-sized packages of said product. Someone determined that squashing the rolls to make them more nearly rectangular allowed use of a smaller shipping box. Every roll goes bump-bump-bump. Mrs. Moleman76 does not like the effect - reminds her of 'controlled release' dispensers from days of yore. I sometimes unpack and flatten loo rolls so that they will take up less room in the rucksack. They're to recircularise to only slightly out of kilter before use. Note: this does not work with loaves, so cheese would have to be re-shaped to fit the bread. You can buy loo rolls without the cardboard centres for camping and the like. The ones we have ar work are like that, they get pushed onto a 10mm spindle. Or you can push the cardboard centre out of a normal one when the bathroom's sufficiently humid. My mum is phobic about toilet roll tubes and makes a urgh-urgh about-to-vomit noise if you wave one at her. The same for kitchen roll. Childhood pastimes remembered. I found pre-flattened toilet rolls in an Italian supermarket. Are you sure that they weren't just a form of pasta? I work for an Italian company and just asked one of my colleagues and she confirmed it's called bogerolli. Funnily enough, Macrobe's first stop on his great national debate PR exercise was in a place called Grand Bourgtheroulde, and I reckon that great bugger-all will come of it. The NSANDI app to check premium bonds winnings isn't working this morning. Good job the website is working OK.
My Saturday Guardian has arrived sans Weekend magazine. You mean that you don’t believe me? Recently I discovered that it's possible to get seat reservations on the train with a season ticket. Great news as often it can be a scrum to get a seat and I really really don't like standing. Growl, show teeth & claws, that should shift them. Even from a bashful, polite bear like yourself. 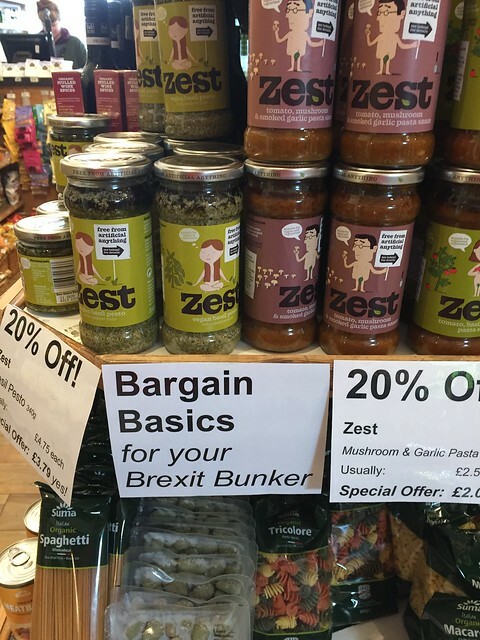 What else to take to the Brexit bunker ? ( while you can still get it ) are essentials for our customers ! I wouldn't be so quick to mock - things like pesto, jars of olives and tapenade do at least help to add flavour to the rat'n'neeps diet will we all be subsisting on. Things in jars and bottles keep a long time, plus the containers come in handy later for home brew, rodent traps and molotov cocktails. Molotov cocktails are fossil fuel powered and bad for the environment. I'm going to be lobbing LiPo batteries instead.